“Piapia Azuls Enamorados” at Casa Victorio, Santa Teresa, Costa Rica, 2019. 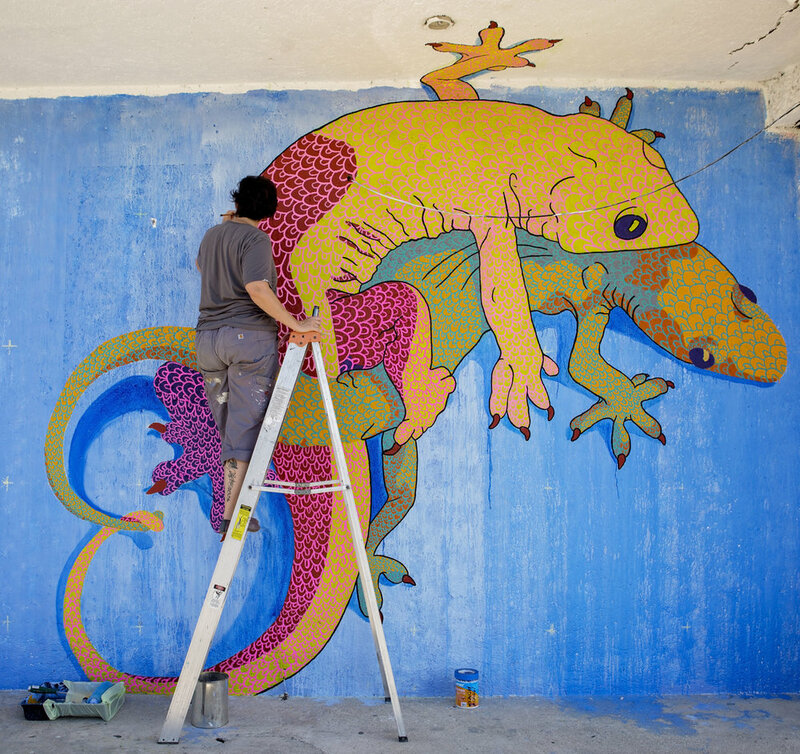 “Geckos Enamorados” for the Akumal Mural Festival, Akumal, Mexico, 2018. “Herons in Love” commissioned for Art on the Atlanta Beltline’s Beltline Walls Mural Festival, August 2018. Sacred Geometry piano for Sing For Hope , NYC, Spring 2017. "System #7" Public art commission from the city of Charleston, WV. Installed on Lee Street, under the I64 underpass in July 2016. Detail of "System #7" Public art commission from the city of Charleston, WV. Installed on Lee Street, under the I64 underpass in July 2016. Burrowing owls mural for the Audubon Mural Project on 145th and Broadway in Harlem, NYC. October 2016. Live painted mural at the Arts on Terry street fair in Patchogue, NY summer 2017. 100 gates project mural at Wedding Banquet Liquor, 135 Division Street @ Canal in the Lower East Side. Sponsored by @lowereastsideNYC and @tigerbeer, spring 2016. Mural on 3 walls designed and painted for the Forest Café, Edinburgh, 2008. "A Tree Grows in Shikshayatan" Community mosaic project organized with students during my tenure as Artist-in-Residence at Shikshayatan Middle School, Tamil Nadu, India.